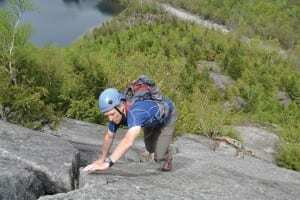 A rock climber could spend a lifetime exploring the Adirondack Park. 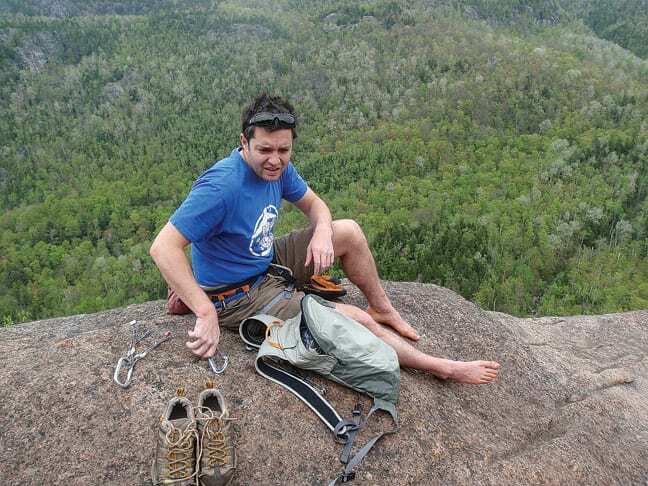 The guidebook Adirondack Rock describes more than 1,900 routes (and the number is growing) on cliffs and crags scattered throughout the region. But you have to start somewhere, and for many climbers, that place is Chapel Pond Slab. Anyone who drives regularly on Route 73 must be familiar with this landmark: an expanse of gray rock that rises about five hundred feet above the road. 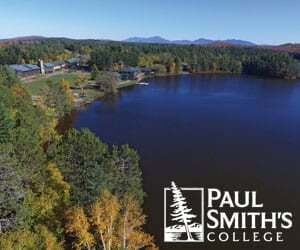 If you’re driving from the Northway toward Keene Valley, you’ll see it on the left just before Chapel Pond. Among climbers, the slab is renowned for its clean rock. 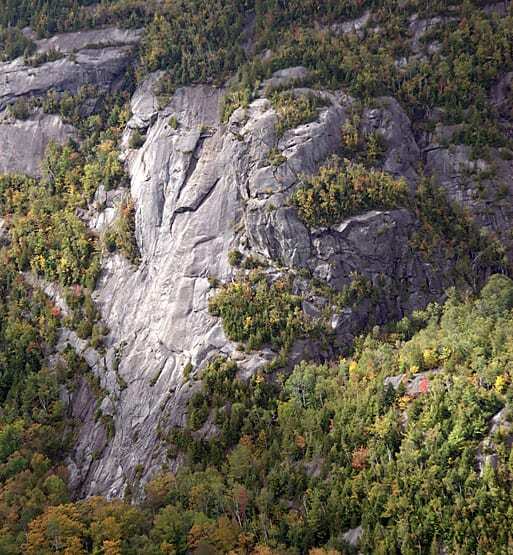 Two of the six routes, known as Empress and Regular Route, receive five stars in Adirondack Rock, the book’s highest rating for overall climbing quality. Because the routes are easy, they attract novices who want to practice multi-pitch climbing. Because they’re fun, they also attract experienced climbers, some of whom ascend solo—that is, without ropes or other protection to stop a fall. The slab’s history adds to the appeal. Those who climb these routes are following in the footholds of greats. Phil Brown works his way up the back side of Bob’s Knob. Photo by Josh Wilson. Regular Route is associated with John Case, another pioneering climber. It evolved from Bob’s Knob Standard, which Case established the same year Wiessner climbed Empress. 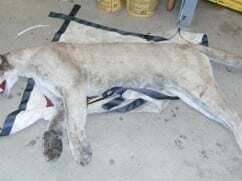 At the time, Case was a past president of the American Alpine Club. Regular Route is a bit harder than Bob’s Knob Standard, but the two still share the same start and finish. This past spring, Josh Wilson and I went to the slab with the intention of climbing both Regular Route and Empress as well as a third route to be determined. All told, we planned to climb roughly 2,400 feet, covering more than twenty pitches. To save time, we decided to climb without a rope. Climbing without protection is not something I would urge on anyone. Nonetheless, the easier routes on the slab do get soloed fairly frequently. Back in the 1980s Jim Cunningham and his buddies regarded the slab as such a breeze that they used to solo it barefoot—sometimes after smoking dope. Weirder things have happened on this billion-year-old rock. Don Mellor, the author of Climbing in the Adirondacks, the rock-climbing bible before the publication of Adirondack Rock, once saw a white-tailed deer going up the slab. Josh and I arrived at the base of the slab thankful for our prehensile toes and sticky-soled shoes. Our first objective was Regular Route, a 775-foot line that’s usually ascended in six pitches, or stages. Ordinarily, the lead climber would stop at the end of each pitch, set up an anchor, and belay the second climber from above. You can imagine how tedious it would be if you did this for twenty-plus pitches. Chapel Pond Slab. Photo by Jim Lawyer. Climbing simultaneously, we polished off the first two pitches in no time, arriving at the base of a large left-arching wall, one of the more conspicuous features of the slab. A rusting piton was hammered into the rock here back when climbers still used pitons. I couldn’t help wondering if it had been pounded in by old Fritz himself, but I later learned its origins remain a mystery. The first piton is where Regular Route diverges from Bob Knob’s Standard. When they ascended the slab, Case and his partner, Bob Notman, traversed to the right below the arching wall and then went up, but Regular Route takes a steeper, more direct line to the top. We surmounted the wall and continued up clean rock to the base of Bob’s Knob, a huge bulge at the top of the slab (named for Case’s partner). This was the start of the fifth pitch. Most of the climbing on Chapel Pond Slab is friction climbing: you ascend by smearing your rubber soles against the rock. It doesn’t take a lot of technique, which is one reason these routes appeal to novices. The next fifty-foot pitch, however, ascends a wall on Bob’s Knob that requires careful placement of feet and hands. This is the one pitch on Regular Route that gives me pause when soloing. So I was not thrilled to discover that the wall was wet from recent rains and snowmelt. Above the chimney, Bob Knob’s Standard rejoins Regular Route. From here, it’s a steep but easy scramble to the top of the knob, with its views of Chapel Pond, lying directly below, and Giant Mountain, rising across the highway. After changing into hiking shoes, we descended via a rough trail and streambed. Climbers have placed ropes to aid the descent in steep sections. An old piton on Bob’s Knob Standard. Photo by Josh Wilson. Once back at the base of the slab, we decided to attempt Regular Route again. This time, Josh brought a short rope and protective gear—cams and nuts that fit in cracks—for the Bob’s Knob pitch. We soloed to the base of the knob in less than twenty minutes. After we tied the rope to our harnesses, Josh ascended the wall easily, topping out on a wide terrace where he anchored himself and then belayed me. Despite the wetness of the rock, I did the pitch without a hitch. As before, we scrambled unroped the rest of the way up the knob. The entire climb took forty-one minutes. Not bad, considering it included a roped pitch, but far from a record. Josh once soloed Regular Route in nine minutes. The biggest challenge lay ahead: Empress. Both Empress and Regular Route are rated 5.5 in difficulty in the Yosemite Decimal System, but to my mind, Empress is harder, or at least scarier. The Yosemite scale used to range from 5.0 to 5.9, so a 5.5 route once would have been considered moderate in difficulty. 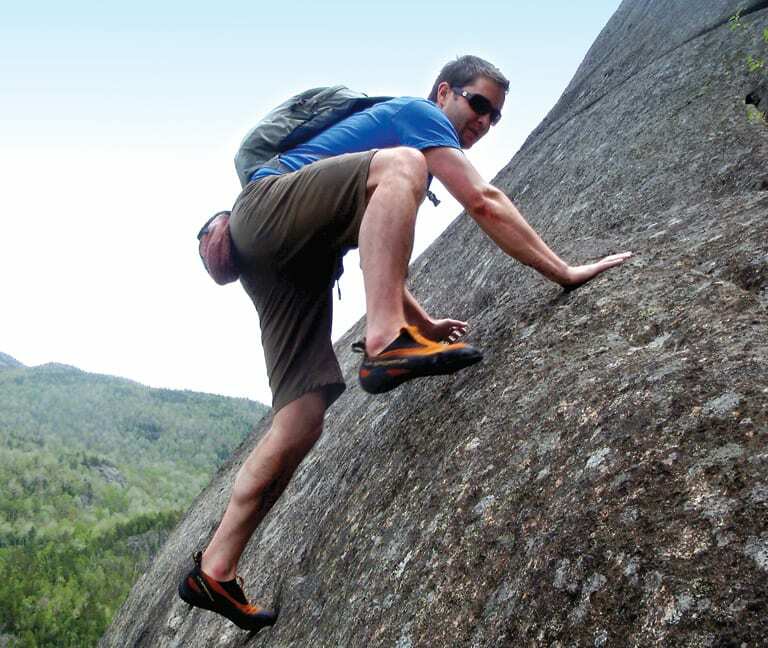 Since then, improvements in rock shoes and gear have enabled climbers to scale ever-harder routes. The system now tops out at 5.15. By today’s standards, a 5.5 route is deemed easy. But anyone who thinks Empress is easy ought to consider that early climbers did it in sneakers or mountaineering boots, using a hemp rope and pitons for protection. The real challenge on Empress begins on the fourth pitch at the top of some rock hummocks. You face a hundred feet of steep slab, followed by an “off-width” crack (too wide for a fist jam, too narrow for squeezing in the torso), followed by another stretch of steep slab. There are few places on this part of the route to place protective gear, so the exposure can be daunting. Since we were climbing without a rope, though, the lack of opportunities for protection was immaterial. When I reached the top of the off-width crack, Josh went ahead to take photos from the top of Bob’s Knob. This gave me several minutes to contemplate what I was about to do: step onto a cliff face three hundred feet above the ground and climb a few hundred feet to the top. Sounds simple enough—if you’re Fritz Wiessner. But I’m not. Last year, I took a nasty fall on the Eagle Slide on Giant, another steep slab. I had scraped much of the skin off my fingers, forearms, and legs. On that day, though, the rock was slippery and I was wearing hiking boots. Everything would be OK this time, I told myself. After all, I had done Empress twice before. Nevertheless, when Josh waved me on, I couldn’t help thinking about my accident. Josh takes a break on top of Bob’s Knob, the finish for Regular Route and Bob’s Knob Standard. Photo by Phil Brown. 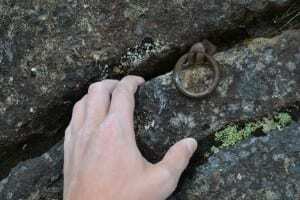 I stepped onto a narrow shelf, perhaps an inch wide, and inspected the rock above for minuscule undulations and cracks—anything for a toehold or finger crimp. 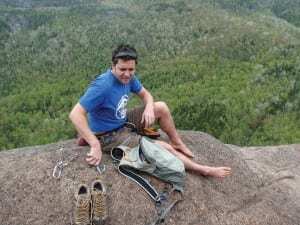 When I started up I had to fight the impulse to scramble over the rock as quickly as possible: it would be safer, I reasoned, to go slowly and deliberately. I tried to focus on my feet, not the air beneath them. Finally I reached an overlap with a good “jug”—a protrusion of rock that can be easily gripped (like a jug handle). Ah, sweet security. After a bit more climbing, the angle of the slab eased, and I hastened to the top, feeling much relieved when I got there. 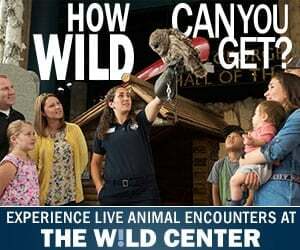 We’ll probably rope up for that one.